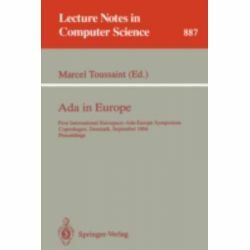 ADA in Europe, First International Eurospace-Ada-Europe Symposium, Copenhagen, Denmark, September 26-30, 1994 - Proceedings by Marcel Toussaint, 9783540588221. « Adaptive Image Processing, A Computational Intelligence Perspective by Stuart William Perry, 9781420084351. Informacje o ADA in Europe, First International Eurospace-Ada-Europe Symposium, Copenhagen, Denmark, September 26-30, 1994 - Proceedings by Marcel Toussaint, 9783540588221. Produkt został dodany 07.10.2014 03:22. Ostatnia zmiana danych produktu miała miejsce 07.10.2014 03:22.